Every year we list LOTS of shows for LOTS of bands by hand. And by LOTS we mean LOTS and LOTS and LOTS. And we can't help but notice when some bands seem to consistently make their way onto our music blob (via the World Wide IntraSphere network) with persistent regularity. Rather than just guess at it, we decided to crunch some numbers, work some hard figures, and pull some real time truth data in order to determine which 10 bands had the most shows listed on Oh My Rockness (NYC) in 2014. The dynamic results are listed below. Presenting…. The 10 Hardest-Working Bands of 2014. It takes hustle. It takes heart. These up-and-coming fuzzy psych rock “post-something" popsters played 50 (!) shows this year. And remember, those are just the ones we listed. 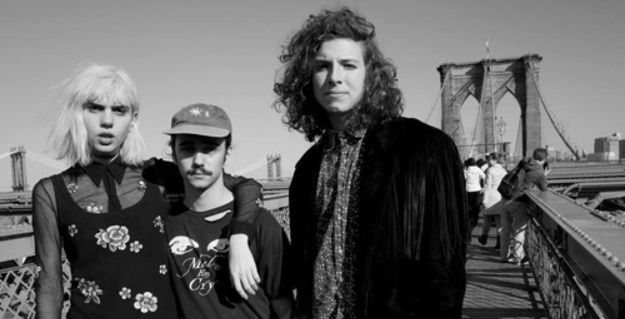 Formed in August of 2013, Sunflower Bean features former members of Supercute! and Turnip Kings and you can read more about them here. Fuzzy haze-gaze band Honduras gets the coveted runner-up slot and this beautiful invisible silver medal. Please enjoy their new 3 song EP released on November 10, 2014 A.D. It really pops. I gotta have my pops. This lo-fi band play super short songs that you can get into super quick. Please read more about them here. And after you're done with that, you can come back and stream the 10 song album they released wayyyyyy back in March (what was 9 months ago even LIKE, mann?). It will probably take you about 16 minutes to listen to. Give or take. We did the math super quick. This band formed in 2010 and are all about them psych zones, man. Here are 10 songs to familiarize yourself with Zula's post-eccentro pop vibes which might be made on Mars. Don't worry. It'll be worth the long trip. More fuzzy popster rock from a band that's self-released a whole lot on the World Wide IntraSphere. You should listen to this full-length album they released on November 11th, 2014 A.D. and I should mind my own business. Please note: these songs swoop, slide, and sprawl. Boytoy are a sunny and (slightly) psych-y trio that write songs that are catchy, catchy, catchy. The following video is recommended if you like make-up and latex. Life Size Maps are a stop-start-left-right-up-down band with rhythms that go perfectly all over the place. The band are set to release their debut full-length soon on Old Flame and we're looking forward to it. Keep that hustle, LSM. Keep that hustle. Haybaby are a smooth trio that's into the fuzz pop too. Here are some songs from the EP they released late last year. Tap them toes, though. OK. Here's the thing about this one. All of these shows (except one) were at Park Avenue Armory over, like, a 10 day period or something. And each show sold out in fractions of a second. I don't really remember the specifics. There are no rear view mirrors here at Rockness HQ. Except for this dynamic 2014 recap article you have just enjoyed and is now done.